Leadership Strategies is the #1 facilitation training and facilitation services company. Leadership Strategies – The Facilitation Company – is the leading provider of professional facilitators and facilitation training in the country. Our facilitators are called upon to lead important executive retreats, strategy sessions, focus groups, conferences and other group sessions. We also provide training classes in facilitation skills, consulting and leadership. We utilize full-time employees and part-time contractors to deliver services to our U.S. and international clients. Employees have a base salary and incentives, with incentives contributing as much as 50% of total compensation. Contractors are compensated per event, with additional incentives related to participating in sales or referral activities. Leadership Strategies – The Facilitation Company is seeking a Marketing Coordinator with proven skills in producing business results to join our growing Marketing team. We are the nation’s leader in providing professional facilitators and facilitation training to corporate, government and non-profit organizations. Our facilitators lead executive retreats, strategy sessions, focus groups, conferences and other group sessions. Through our flagship training course, The Effective Facilitator, we have trained more people in facilitation skills than any other organization in the US. We also provide training classes in consulting skills, presentation skills, leadership and other areas. The overall goal of our marketing team is to present our organization and our capabilities in a way that leads to a steady stream of highly qualified leads for our training and consulting services. The successful candidate will report to the Marketing Director and will serve both as a direct contributor to marketing initiatives. The successful candidate for our Marketing Coordinator will have a proven history of displaying certain clearly defined core competencies. 1. Collaboration. As the leading facilitation company in the nation, we are highly collaborative in our decision-making, believe strongly that great ideas can come from anywhere in the company, and therefore place a premium on giving opportunities for input. If you enjoy making decisions on your own and find it bothersome to hear the input of others, you will not find a comfortable home here. 2. Coachable learner. No one is perfect. We find that people are better when they recognize the areas in which they need to improve. If you can’t identify one or two areas you are working on improving right now, or if you are afraid to admit mistakes you’ve made in the past and what you learned from them, or if you can’t name any changes you have made based on feedback you have received, we are not the right environment for you. 3. Drive for Achievement. Our Marketing Coordinator will have an exceptional level of motivation, energy and drive. We are a small but mighty Marketing team and we’re focused on extremely high levels of achievement. So, we need every member of our team focused on their own personal and professional success. We are the right place for team members who enjoy working hard, accomplishing big things, collaborating and gaining insights from others, and developing their skills. Create shareable content appropriate for specific networks to both spread our brand and our content and links. Listen and engage in relevant social discussion about our company, competitors, and/or industry, both from existing customers and leads and from brand new audiences that don’t yet know us. Stays current with marketing trends by participating in educational opportunities; reading trade publications and meeting with internal teams. Report on business results from marketing activities including emails, LiveChat, social media, marketing campaigns, etc. Associate’s Degree in Business, Marketing, Communications, or related field. Excellent communicator and creative thinker, with an ability to use both data and intuition to inform decisions. Ability to see the “big picture” and make sure the goals are aligned well with company goals. Not afraid to make recommendations for a better approach. Ability to understand dependencies, risks and timelines. Good ability to rapidly re-prioritize and multi-task while delivering against key goals. Have strong knowledge of marketing principles and social media avenues. A self-starter who understands exactly what a project is all about from the outset, and how to complete it quickly and effectively. Have excellent organization and planning skills, able to set priorities and accomplish tasks; ability to juggle multiple projects simultaneously and work efficiently under deadlines. Communicates effectively both verbally and in writing. A writing sample (either marketing copy or formal correspondence) must be presented at time of interview. Ability to write clearly and concisely about a wide variety of topics, including industries, cloud technology and professional services. To apply, please submit your resume and cover letter to personnel@leadstrat.com. Leadership Strategies – The Facilitation Company is seeking a Marketing Content Specialist with proven skills in producing business results to join our growing Marketing team. The overall goal of our marketing team is to present our organization and our capabilities in a way that leads to a steady stream of highly qualified leads for our training and consulting services. The successful candidate will report to the Marketing Director and will serve both as an orchestrator and a direct contributor to marketing initiatives. The successful candidate for our Marketing Content Specialist will have a proven history of displaying certain clearly defined core competencies. Collaboration. As the leading facilitation company in the nation, we are highly collaborative in our decision-making, believe strongly that great ideas can come from anywhere in the company, and therefore place a premium on giving opportunities for input. If you enjoy making decisions on your own, and find it bothersome to hear the input of others, you will not find a comfortable home here. If you have difficulty accepting changes to a plan you have created, this is likely not the right fit for you. Coachable learner. No one is perfect. We find that people are better when they recognize the areas in which they need to improve. If you can’t identify one or two areas you are working on improving right now, or if you are afraid to admit mistakes you’ve made in the past and what you learned from them, or if you can’t name any changes you have made based on feedback you have received, we are not the right environment for you. Drive for Achievement. Our Content Marketing Specialist will have an exceptional level of motivation, energy and drive. We are a small but mighty Marketing team and we’re focused on extremely high levels of achievement. So, we need every member of our team focused on their own personal and professional success. We are the right place for team members who enjoy working hard, taking initiative, accomplishing big things, collaborating and gaining insights from others, and developing their skills. Participate in the development and tactical execution of content marketing initiatives which drive traffic, engagement, and leads to deliver sales and customer retention. Plan, write, edit, and distribute content marketing and communications materials as assigned, including blog posts, whitepapers, e-books, webinars, web-based content, email communications, product fact sheets, brochures, case studies, newsletter articles, advertising, social media posts, and other material as requested. Produce high quality content internally or with the help of agency partners that is relevant to specific business segments including vertical markets, buyer personas and stages along the customer journey. Accountable for proofing, editing, copywriting, quality assurance and optimization of offline and online content, marketing campaigns and brand messaging in accordance with corporate standards. Maintain and manage project schedules, approvals, and resource plans to ensure projects are delivered in a timely manner and within budget. Continually audit and update web and collateral content as product or company information changes. Manage organic search engine performance and goal-setting based on site impressions, clickthrough rates, traffic, and conversions. Stay up-to-date with the latest trends and changes with SEO and major search engines. Education: B.A. or B.S. in Communications/Journalism/Marketing or equivalent experience. Experience: Three to five years of experience in communications and/or content marketing. B2B and B2C experience desired. Specific Skills: Word, Excel, PowerPoint, Outlook; Copywriting, digital asset management (DAM) and WordPress experience desired. Experience with ClickDimensions and Microsoft Dynamics CRM a plus. Excellent oral, written, and communication skills. Strong attention to detail. Ability to achieve thoroughness and accuracy when accomplishing a task. Ability to manage multiple competing tasks and projects while meeting related deadlines and budget targets. Ability to contribute to the creative process and development of content marketing strategies. Strong conceptual thinker with an editorial mindset that seeks to understand what content audiences want/consume and how to create it. Assist with capturing and integrating voice of the customer into marketing communications projects. A dual-minded approach: You’re highly creative and an excellent writer but can also be process-driven, think scale, and rely on data to make decisions. Excellent communicator and creative thinker, with an ability to use data to inform all decisions. NOTE: As this is a position that relies heavily on written communication skills, please submit a cover letter with your resume. Applications without a cover letter will not be accepted. Leadership Strategies – The Facilitation Company is seeking a Sales Development Representative (SDR) with proven skills to join our growing Sales team. We are the nation’s leader in providing professional facilitators and facilitation skills training to corporate, government and non-profit organizations. Our facilitators lead executive retreats, strategy sessions, focus groups, conferences and other group sessions. Through our flagship training course, The Effective Facilitator, we have trained more people in facilitation skills than any other organization in the US. We also provide training classes in consulting skills, presentation skills, leadership and other areas. The overall goal of the SDR function is to identify and create qualified leads that will turn into sales opportunities for our Client Executive sales team to convert into successful customers. The successful candidate will report to the Vice President of Sales and will work closely with the Marketing Team and the Sales Team in follow up to Marketing and Sales driven campaigns. The successful candidate for our Sales Development Representative position will have a proven history of displaying certain clearly defined core competencies. 1. Collaboration. As the leading facilitation company in the nation, we are highly collaborative in our decision-making, believe strongly that great ideas can come from anywhere in the company, and therefore place a premium on giving opportunities for input. If you enjoy making decisions on your own, and find it bothersome to hear the input of others, you will not find a comfortable home here. 3. Drive for Achievement and Growth. Our Sales Development Representative will have an exceptional level of motivation, energy and drive. We are a small but growing organization and we’re focused on extremely high levels of achievement. We have a high performance sales culture and we need every member of our team focused on their own personal and professional success as well as the success of the team. We are the right place for team members who enjoy working hard, accomplishing big things, collaborating and gaining insights from others, and developing their skills. We are looking for a talented, motivated individual to execute inbound and outbound lead activity on specific Marketing and Sales Drip campaigns, execute outbound prospecting calls to target and client accounts, qualify leads, and generate first appointment conversations for the Client Executives. This person will also have responsibility for selling registrations to our open enrollment Public Class workshops. A key component to success will be the ability to conduct business dealings in a way that creates a superior prospect experience that will set the stage for effective sales follow-up, as well as future product sales. This role requires a high level of creativity, attention to detail, and communication skills. Those who are successful in this position have the opportunity over time to be considered for one of our other sales team roles. Qualifying leads from marketing campaigns as potential sales opportunities and setting first meetings or calls for Client Executives (CE’s). Qualifying leads from CE specific email campaigns as potential sales opportunities and setting first meetings or calls for the appropriate CEs. Disseminate leads to appropriate CE, educating them as necessary about the potential opportunity. Identify client needs and areas of potential interest. Proactively reach out to Webinar registrants and participants who are not active leads and create and close Public Class Seat opportunities. Respond to Public Class leads that are assigned to them, convert to opportunities and close as sales. Successfully manage and overcome prospect objections. Conduct follow up calls on workshop attendees to determine their level of satisfaction with the training and identify future training opportunities. Identify opportunities for and strategize approaches to successfully attain greater reach. Perform any administrative activities to support the sales team, including timely updating of engagement summaries and tracking all activities in the CRM system. Meet and exceed sales and business development goals as established by management. Attend trade shows, increase skills through training, moderate webinars, attend association meetings of facilitators and other outside activities as your manager deems beneficial. Report to the Vice President of Sales on (weekly/monthly/quarterly) results. Education: B.A. or B.S. in Marketing, Business Administration or equivalent experience. Microsoft Word, Excel, and Outlook experience. Experience with Microsoft Dynamics CRM a plus. Ability to ENTHUSIASTICALLY ENGAGE people in conversation by asking questions to identify their goals and needs. Be positively persistent. If rejection is a problem for you, this is not the place. Ability to manage multiple competing tasks. The highest level of integrity. Strong customer, entrepreneurial, quality, and results orientation. Strong planning and organizational skills. Thoroughness and attention to detail in follow up. Ability to collaborate and work well within a team. To apply send your resume AND a cover letter to personnel@leadstrat.com that responds to the below items. Applications without a cover letter will not be accepted. Self-Starter – Tell us about a time or situation where your success came largely from being a self-starter. Be specific about the things that, if you not initiated them on your own, would have made it difficult to succeed. Engaging Clients – We would like to get an idea of your ability to engage prospects over the phone. Choose a product that you have sold in the past or, if you have no previous sales experience, a major item (car, golf clubs, musical instrument, etc) that you have purchased recently. Give us the 2 – 5 sentences you would use if you were contacting a prospect for the first time about that product. Coachable learner – Tell us about a change you have made in the past two years in the way you sell, based on feedback you have received. Experience – Describe your experience, if any in the areas of sales, inside sales, sales or business development, lead generation, etc. described above. If you have no sales experience, describe your business experience that you believe makes you a good fit for this position. We recognize that we are asking you for a lot of information. However, by answering the questions in your narrative letter, you will demonstrate that you understand our needs and are a good fit for this position. Leadership Strategies – The Facilitation Company is seeking a Business Development Consultant (BDC) with proven skills to join our growing Sales team. The overall goal of the BDC function is selling registrations for our public (open enrollment) classes. Additionally, you will be asked to uncover private (onsite) class, and meeting facilitation services needs and work with one of our Client Executives on these potential opportunities. The successful candidate will report to the Vice President of Sales and will work closely with the entire Sales Team to drive revenue for our Public Class workshops. The successful candidate for our Business Development Consultant position will have a proven history of displaying certain clearly defined core competencies. We are looking for a talented, motivated individual to follow up on leads for Public Class workshops. You will also proactively reach out to individuals who register for or attend our monthly webinars but who are not active leads with the goal of creating interest and closing additional Public Class opportunities This is an inside sales position with 50% or more of your day spent interacting with clients and potential clients over the phone. Working to ensure that each public class scheduled is filled and includes, at a minimum, the number of participants to avoid cancellation. Follow up on all leads provided in a timely fashion (typically 24-48 hours). Follow up with public class attendees from the prior month within one week of the class to seek referrals and other opportunities. Prospect and provide follow-up to targeted lists. Manage and nurture a pipeline of potential Public Class attendees to maximize sales results. Average at least 50 telephone sales call per day. Identify possible Private Class or Meeting Facilitation opportunities that arise out of Public Class sales conversations. Experience: Mandatory minimum 1-3 direct sales experience. Experience: Mandatory at least one year in a position requiring heavy prospecting activity. Be positively persistent. You will be fortunate to close 1 out of 20 leads. If rejection is a problem for you, this is not the place. Proactive Pipeline Creation – Tell us about a time you proactively grew your pipeline and what specific steps you took to accomplish this. Engaging Clients – We would like to get an idea of your ability to engage prospects over the phone. Choose a product that you have sold in the past, and give us the 2 – 5 sentences you would use if you were contacting a prospect for the first time about that product. Experience – Describe your experience in those areas sited in the “Experience Mandatory” section above. Also describe your experience for any of the “Desirable” areas you meet. Use bullet points and give dates, quota performance, etc. Are you ready to work for the leader in the facilitation industry? Leadership Strategies – The Facilitation Company is an Atlanta-based organization that has rapidly become the national leader in facilitation. We are the number one provider of facilitation training in the country with over 23,000 people trained in our flagship course, The Effective Facilitator. We also are the leading provider of professional facilitators—experts who lead executives through strategic planning, brainstorming, issue resolution, team building, and other critical sessions. We are seeking senior contract facilitators in the SEATTLE and LAS VEGAS areas with master-level facilitation skills and significant experience in training and group facilitation. The ideal candidates will be both highly skilled group facilitators—with a wealth of experience leading groups through such activities as strategic planning, issue resolution, brainstorming, action planning, focus groups, and information requirements gathering—as well as top-class training facilitators. This is a part-time contract position with an estimate of 120-300 hours per year. Training compensation is $1200/day. Meeting facilitation typically ranges from $1400-$2000/day. Note: After acceptance as a contractor, we have a rigorous, seven-step certification process that includes attending our flagship course as well as co-teaching twice with a certified instructor. We have a specific application process to give you an opportunity to stand out from the crowd. Describe your experience citing adequate detail to demonstrate that you meet the requirement (e.g., organization, types of sessions and number). Bullet points are sufficient. Describe your style and what evidence (e.g., from clients, peers) you can cite to validate your description. Leadership Strategies – The Facilitation Company (www.leadstrat.com) is an Atlanta-based organization that has rapidly become the national leader in facilitation. We are the number one provider of facilitation training in the country with over 20,000 people trained in our flagship course, The Effective Facilitator. We also are the leading provider of professional facilitators—experts who lead executive groups through strategic planning, brainstorming, issue resolution, team building, and other critical sessions. We are looking for a professional Instructional Designer based here in Atlanta to support our Product Team in the design and development of learning experiences. The ideal candidate will be an experience instructional designer with over five year of experience designing ILT, eLearning, video, social media, and mobile training solutions and be adept at using technology in design. The successful candidates must possess a talent for creating concise, audience-targeted instructional development. You will be responsible for developing original material as well as contributing to the work of others across a variety of instructional mediums. Position requirements include project management, content management, and writing skills. Knowledge of adult learning theory and instructional systems design is required. The position also requires experience using a variety of online learning development tools. Note: There is a specific application process as defined at the end of this job description. Our Instructional Designer will have a proven history of displaying certain clearly defined core competencies. We are assuming that all candidates qualified for this position will be skilled in the basics of an excellent work ethic, organized time management skills, and doing what’s necessary to complete tasks on deadline. However, after these minimums are met, the skills on which we will base this selection can be categorized into the following key areas. Our Instructional Designer will both be a big thinker and will have demonstrated the ability to follow through and get initiatives implemented. He/she will have strong analytic skills with an eye for quality and detail. The Instructional Designer will take a “whole company” focus and will respond and relate well to the others in the organization. The Instructional Designer will be innovative and have a track record of creating new ideas and achieving targeted results from implementing them. Our Instructional Designer will be expected to be a collaborator and to value seeking and gaining the insights from others as part of the decision-making process. The successful candidate will have exceptionally high levels of self-awareness and transparency. The candidate will have had experiences in which he or she improved through guidance from others. The Instructional Designer will be open to challenge, easy to develop, and responsive to coaching. Our Instructional Designer will set an example for serving internal and external clients with respect and the highest level of integrity and responsiveness through excellent communication and follow through. Our Instructional Designer will do the homework needed to make sure we are prepared and ready to serve clients at a level beyond their expectations. Finally, the Instructional Designer we hire will have values that are closely aligned with our own. At Leadership Strategies we cherish the culture and work environment that we have created and we invite to join us only those who demonstrate high levels of personal responsibility, integrity, continuous improvement, customer needs focus, teamwork, ownership thinking and collaboration. In our organization the end does not justify the means and we expect people to hold themselves to high moral standards of trustworthiness, loyalty and honesty, both personally and professionally. As associates of Leadership Strategies, we actively create the workplace we desire by living the following values and behaviors. The successful candidate will share these values as well. We make collaboration a habit. We believe collaboration leads to better decisions with higher levels of buy-in and commitment to action. Therefore, with few exceptions, we invite input prior to decisions, involve appropriate stakeholders in the decision process, and communicate decisions to all impacted. If you prefer to make decisions on your own or find it uncomfortable to have people question your ideas, this is probably not the place for you. We take personal responsibility. If we have an issue, we take responsibility for getting it solved (as opposed to complaining to others or withdrawing); when we make mistakes we admit our responsibility. If you find that you make it a habit of talking about negative situations to co-workers who have no power to address the situation (we call this gossiping), please apply elsewhere. We seek continuous improvement. We strive not to make the same mistake twice. When a mistake is made, not only do we correct it, we seek to understand why the mistake occurred and what we need to do to prevent it from happening again. If you have trouble talking about mistakes you have made and what you learned from them, this position is probably not in your future. We meet our clients’ needs, not just satisfy their requirements. We strive to understand our clients’ real needs to ensure that we provide solutions that work. If you lack the skills or the inclination to probe for understanding to maximize an opportunity, this position will likely frustrate you. We maintain a positive, team environment. We are positive in our communications and we support each other with assistance, information and guidance, as opposed to being concerned only about self and bringing negative energy into the workplace. If you believe your fellow employees don’t have to like you, they just have to respect you, don’t waste your time applying. We do the right thing, even when no one is looking. We strive to maintain a high level of integrity and consistency in our interactions with our clients and each other. Dishonesty is not tolerated. Enough said. We operate in the company as if it were our own. We constantly seek opportunities to increase our company’s profitability. If you are ready to be a part of something special, where culture is as important as performance, where speaking up is welcome and high engagement is the norm, we welcome hearing from you. All positions at Leadership Strategies have a base salary and incentives for high performance. With salary and incentives, the successful candidate can expect $75K the first year. You must send a resume and cover letter which responds to the following questions to dadelman@leadstrat.com. Describe your experience citing adequate detail to demonstrate that you meet each requirement (e.g., month-year, what you did, results achieved). Bullet points are sufficient. Strong analytical skills with an eye for quality and detail. Describe an instructional design assignment in which you had to produce a detailed, high-quality work product. What was the product? What about the assignment makes it an excellent example of your analytical skills and eye for quality and detail? We recognize that we are asking you to give considerable information about your suitability for this position. While we want to give you an opportunity to fully highlight your skills, at the same time we want to make sure the person we hire understands our needs and that the business relationship with our firm is truly a win-win. NOTE: If you send us a standard cover letter that describes your skills without responding to our specific questions above, we will likely assume that this position is not suitable for you. Leadership Strategies will be the provider of choice for facilitation. When an organization needs a facilitator or facilitation-related, soft skills training, they will think first of Leadership Strategies – The Facilitation Company. To serve as a facilitator of positive, impactful results for our clients through practical, dynamic, and interactive facilitation and training services. We believe facilitation is a powerful tool for helping people reach better decisions, often faster, with much higher levels of buy-in and commitment. Better decisions…because a diversity of views were openly shared and considered. Often faster…because the processes used promote productive and efficient communication. the decisions were involved in creating them. The more productive and effective an organization can be. We offer public and on-site private classes to clients throughout the U.S., Canada and Australia. Not what you’re looking for? Visit our private training page. 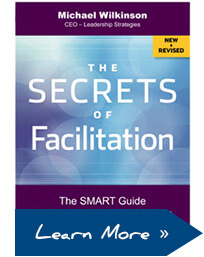 Thoroughly revised and updated, Michael Wilkinson’s 2nd edition of The Secrets of Facilitation delivers a clear vision of facilitation excellence and reveals the specific techniques effective facilitators use to produce consistent, repeatable results with groups. © 2015 Leadership Strategies, Inc. All Rights Reserved.